Daniel Marcial based in Mexico City has created a new Raspberry Pi powered music score reader called the Notagrama, which uses machine vision to read sheet music. The Raspberry Pi powered device is the first first didactic product to learn to read sheet music and the open source project is now available to back via Kickstarter. The notagrama is a didactic product consisting of a large sheet with two staves, chips in the form of musical symbols and a computer capable of reproducing the melody formed by the chips. The notagrama works with machine vision technology, it has a camera placed above the sheet with which the computer determines the position and shape of the chips to constitute a melody and reproduce it by the speakers. 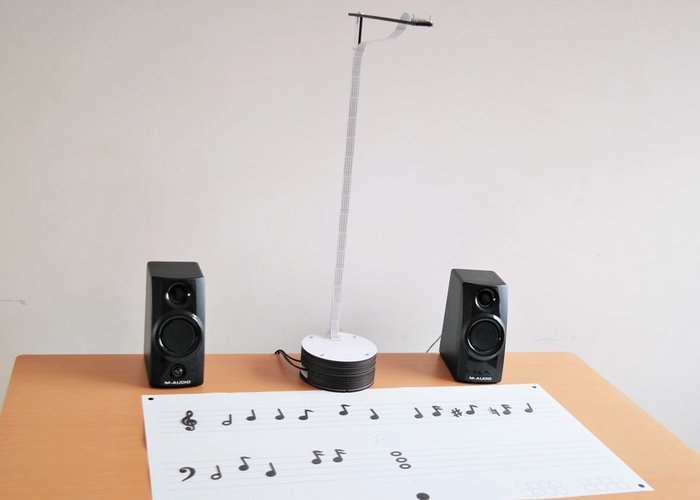 The notagrama can be used to practice reading and writing scores, composing melodies, imparting music classes or to have fun playing with musical notes, it is a project that allows interaction with musical symbols in a tangible and innovative way. The notagrama is plug and play, you don´t need know about computing and programming to use it. Just connect power and speakers, form a melody with chips and put a circular chip on the “play zone” to listen the melody ! – Raspberry Pi 3 with preloaded software and SD. – Cable for raspberry camera (1 meter). – Base for camera and Raspberry. – Power source for raspberry. – Chips in the form of musical symbols. For more details jump over to the official Kickstarter campaign page by following the link below. If you enjoy building Pi projects you might be interested in our comprehensive list of Raspberry Pi displays, HATS and small screens.